The University of Basel (German: Universität Basel) is located in Basel, Switzerland. Founded on 4 April 1460, it is Switzerland's oldest university and among the world's oldest surviving universities. The university is traditionally counted among the leading institutions of higher learning in the country. The associated Basel University Library is the largest and among the most important libraries in the country. The university hosts the faculties of theology, law, medicine, humanities and social sciences, science, psychology, and business and economics, as well as numerous cross-disciplinary subjects and institutes, such as the Biozentrum for biomedical research and the Institute for European Global Studies. In 2016, the University boasted 12,852 students and 377 professors. International students accounted for 24 percent of the student body. In its over 500-year history the university has been home to Erasmus of Rotterdam, Paracelsus, Daniel Bernoulli, Leonhard Euler, Jacob Burckhardt, Friedrich Nietzsche, Tadeusz Reichstein, Karl Jaspers, Carl Gustav Jung, Karl Barth and Jeanne Hersch. The institution is associated with nine Nobel prize winners and two Presidents of the Swiss Confederation. The University of Basel was founded in connection with the Council of Basel. 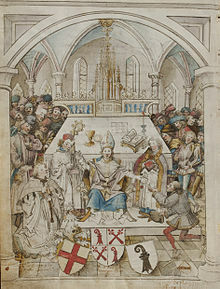 The deed of foundation given in the form of a Papal bull by Pope Pius II on November 12, 1459, and the official opening ceremony was held on April 4, 1460. Originally the University of Basel was decreed to have four faculties—arts, medicine, theology, and jurisprudence. The faculty of arts served until 1818 as the foundation for the other three academic subjects. In the eighteenth century as Basel became more commercial, the university, one of the centres of learning in the Renaissance, slipped into insignificance. Enrollment which had been over a thousand around 1600, dropped to sixty in 1785 with eighteen professors. The professors themselves were mostly sons of the elite. Over the course of centuries as many scholars came to the city, Basel became an early centre of book printing and humanism. Around the same time as the university itself, the Basel University Library was founded. Today it has over three million books and writings and is the largest library in Switzerland. Located in what was once a politically volatile area, the University's fate often ebbed and flowed with regional political developments, including the Reformation, the Kantonstrennung (separation of the Canton of Basel City from Basel Land), and both World Wars. These factors affected student attendance, funding, university-government relations. In 1833 the Canton of Basel split in two with the Federal Diet requiring that the canton's assets, including the books at the University library, be divided—two-thirds going to the new half canton of Basel-Landschaft. The city, Basel-Stadt, had to buy back this share and the university became so impoverished that it drastically reduced its course offerings. Students were expected to continue their education after two years or so at a German university. Student enrollment surged after the University shed its medieval curriculum (including the elimination of Latin as the official language of the course catalog in 1822) and began to add more faculties, especially those in the humanities and sciences. Liberal Arts became a faculty in 1818, from which the Philosophy and History and Natural History faculties were derived in 1937. The University subsequently established the Faculty of Science (1937), the Faculty of Business and Economics (1996), and the Faculty of Psychology (2003). During the 20th century, the University grew rapidly, from one thousand students in 1918 to eight thousand in 1994. The first woman who was admitted to the University, Emilie Frey, began her medical studies in 1890. After the seizure of power in the year 1933 by the Nazis, numerous renowned German professors decided to emigrate to Basel and started to work at the University of Basel. Several Swiss scholars also returned, inter alia the Law Professor Arthur Baumgarten (1933), the Theologians Karl Barth (1935) and Fritz Lieb (1937) and after World War II the Philosopher Karl Jaspers from Heidelberg University (1948), as well as the surgeon Rudolf Nissen (1952). On January 1, 1996, the University of Basel became independent from the cantonal government and thus earned its right to self-government. In 2007, the Canton of Basel-Landschaft voted in favor to share the sponsorship of the University in parity with the Canton Basel-Stadt. Since January 1, 1996, the University of Basel has been independent. The University Law of 1995 stipulates that, “The University of Basel is an institution established under public law. It has its own legal personality and right to self-government.” As the entity that formally receives the Performance Mandate (Leistungsauftrag) for the University from both supporting cantons, the University Council (Universitätsrat) is the supreme decision-making body of the University. The Council consists of eleven voting members and three non-voting members, including the President, the Executive Director, and the Secretary of the Council. Beneath the University Council are the Senate (Regenz) and the President's Board. The 80-member Senate consists of the senior members of the President's Board, faculty deans, professors, lecturers and research assistants, assistants, students, and administrative and technical employees. The President's Office is tasked with leading the overall university business. It consists of the President and her staff, a General Secretariat, an Administrative Directorate, the Communications and Marketing Office, and two respective Vice-Presidents for Research and Education. The University hosts several formal institutions that are intended to serve the needs of its students. The Student Advice Center provides advice on academic degree programs and career opportunities. The Student Administration Office provides information on applications, grants, mobility, exchanges, and disability services. There are also a variety of organizations that cater to international students, such as local chapters of Toastmasters and AIESEC, and associations that perform community services (Beraber, for instance, provides remedial lessons to immigrant youth). There is a foreign affairs association (Foraus), a Model United Nations team, and various choirs and orchestras. There are also various religious groups. A number of other student groups exist out of formal venues. The most recognizable are the “Studentenverbindungen,” traditional student associations dating from the 19th century that organize social events, share common uniforms, and often focus on particular hobbies, such as sword fighting. Such associations include the Akademische Turnerschaft Alemannia zu Basel, AKW Raurica, Helvetia Basel, Jurassia Basiliensis, Schwizerhüsli, A.V. Froburger, and Zofingia. Membership in many is restricted to men, though A.V. Froburger also accepts women. University Sports provides a gym, fitness classes, and sport and dance camps to students and employees of the University. The Studentische Körperschaft der Universität Basel (skuba) speaks on behalf of the students and represents their needs and interests. It acts as an official student representative and has no political or religious affiliations. The University has a general alumni association, AlumniBasel, as well as specific alumni associations for the Europainstitut, Medicine, Law, Business and Economics, Dentistry, and Nursing. ^ "Facts & Figures". www.unibas.ch. Archived from the original on 25 August 2017. Retrieved 28 November 2017. ^ "Die Rektorin". www.unibas.ch. Archived from the original on 28 April 2017. Retrieved 28 November 2017. ^ a b c d "Facts and Figures University of Basel". Archived from the original on 2017-02-02. ^ Universities, Swiss. "University of Basel". Swiss Universities Handbook - Top Universities in Switzerland. Retrieved 7 April 2018. ^ "All Nobel Prizes". www.nobelprize.org. Retrieved 2018-02-10. ^ Bundesrat, Der. "Bundespräsidenten". www.admin.ch (in German). Retrieved 2018-02-10. ^ Fellmann. "550 Jahre Universität Basel". www.unigeschichte.unibas.ch. Archived from the original on 11 April 2014. Retrieved 28 November 2017. ^ Kreis, Georg. "Universität Basel". HLS-DHS-DSS.CH (in German). Retrieved 2018-02-10. ^ Fellmann. "550 Jahre Universität Basel". www.unigeschichte.unibas.ch. Archived from the original on 28 March 2016. Retrieved 28 November 2017. ^ Fellmann. "550 Jahre Universität Basel". www.unigeschichte.unibas.ch. Archived from the original on 25 September 2013. Retrieved 28 November 2017. ^ "THE ranking". Archived from the original on 2017-03-25. ^ "Leiden Ranking". Archived from the original on 2017-01-27. ^ "ARWU". Archived from the original on 2015-05-23. ^ "Aufgaben". www.unibas.ch. Archived from the original on 28 November 2017. Retrieved 28 November 2017. ^ "Theologische Fakultät". Pages.unibas.ch. Archived from the original on 10 July 2008. Retrieved 2 October 2011. ^ "Juristische Fakultät Universität Basel". Ius.unibas.ch. Archived from the original on 16 October 2011. Retrieved 2 October 2011. ^ "Webseite der Medizinischen Fakultät Basel". Medizin.unibas.ch. Archived from the original on 6 October 2011. Retrieved 2 October 2011. ^ "Philosophisch-Historische Fakultät". Philhist.unibas.ch. Archived from the original on 7 October 2011. Retrieved 2 October 2011. ^ "Philosophisch-Naturwissenschaftliche Fakultät". Philnat.unibas.ch. 29 July 2011. Archived from the original on 25 September 2011. Retrieved 2 October 2011. ^ "WWZ: Home". Wwz.unibas.ch. 26 September 2011. Archived from the original on 8 September 2011. Retrieved 2 October 2011. ^ "Fakultät für Psychologie". Psycho.unibas.ch. 28 September 2011. Archived from the original on 7 October 2011. Retrieved 2 October 2011. ^ "Europainstitut: Home". europa.unibas.ch. Archived from the original on 25 October 2017. Retrieved 28 November 2017. ^ FMI. "FMI - Friedrich Miescher Institute for Biomedical Research". www.fmi.ch. Archived from the original on 19 July 2017. Retrieved 28 November 2017. ^ "Dr. Jack Dean Kingsbury Chair of New Testament Theology". Retrieved 10 February 2019. ^ "Student Advice Center". www.unibas.ch. Archived from the original on 2 February 2017. Retrieved 28 November 2017. ^ "Page not found". www.unibas.ch. Archived from the original on 2 February 2017. Retrieved 28 November 2017. ^ "Student Organizations". www.unibas.ch. Archived from the original on 30 September 2015. Retrieved 28 November 2017. ^ "Universitätssport". www.unibas.ch. Archived from the original on 30 October 2017. Retrieved 28 November 2017. ^ "Über uns – Studentische Körperschaft der Universität Basel". www.skuba.ch. Archived from the original on 27 March 2017. Retrieved 28 November 2017. ^ "Alumni". www.unibas.ch. Archived from the original on 1 August 2017. Retrieved 28 November 2017. Wikimedia Commons has media related to University of Basel. Swiss Tropical and Public Health Institute (Swiss TPH) – an associated institute of the university – travel and tropical medicine, international health, medical parasitology and the biology of infection, public health and epidemiology.